The Grumman G-21 was originally developed for a 1936 requirement for a small civilian amphibious transport. In those days, not all small islands in various parts of the world had airports, so amphibians were the best way to quickly get around the various archipelagos. The first plane was delivered in 1937 and many are still flying today. Naturally, something that well built caught the eye of the military and many were purchased for various duties by the Navy, Army and the Coast Guard. It was used mostly for coastal patrol, air-sea rescue and the ever popular utility duties. It was also capable of operating on skis and I'm sure there were times when it was able to do wheels up landings in soft snow or on ice. It carried either 4-6 passengers or up to 650 lbs of ordinance on two wing racks. It was not a fast plane and not designed to really be in harm's way. However, its utilitarian nature was such that is was around a lot longer than many of its more aggressive cohorts! The kit itself is very similar to the more recent A-8 Shrike kit from the folks at Czech Model. Detailing is excellent with rather crisply done engraved panel lines. The fabric representation on the control surfaces is properly subdued. In fact, much of the kit reminds me a great deal of the Sword 1/72 version in the way the parts are engineered. Perhaps there is only one way to do a Goose. You may take me to task for not showing a photo of all the bits laid out, but it as much a matter of space as anything else. This is not a small kit and I'd say it is the largest Czech Model has yet done. A few differences between the drawing and reality are that the canopy is in two parts, separated down the middle and not a single piece. Too bad as many of us don't do well with these types of clear part. The clear parts are not that bad in that they are relatively thin but mine suffer from scratches and a few have torn away from the sprue thanks to the bits just being tossed into the box with no other protection. There are also nice resin replacement engines for the rather simplified and generic plastic ones provided on the sprues. A set of 'flattened' wheel assemblies is also provided should you wish to use them and they aren't as flat as many produced by True Details. Other than using the bombs and bomb racks, there are really no options. The instructions are getting better all the time. In addition to the 10 construction diagrams, the sheet provides color and decals notes. Colors are matched to FS 595 standards. 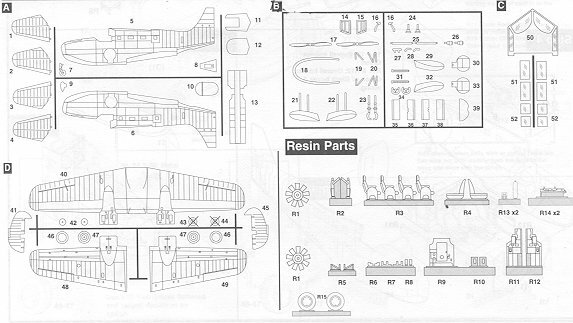 In the various construction steps, there is color information provided for each part used. There are also placement guides for exactly where to put the bomb racks and a general guide on the float bracing wires. The decal sheet for this kit is huge. It is fully as wide as the box and most colorful. 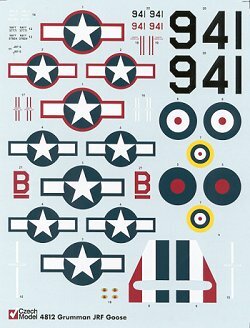 Markings are provided for four aircraft; three US and one British. Unfortunately for us all, the JRF was often devoid of any really interesting markings and these are no exception. I'd like to think that an aftermarket sheet will be done for this plane, but it is rare for a short run kit to receive the attention of the aftermarket people. Perhaps this one will. The British markings are for an RAF Coastal Command plane in Extra Dark Sea Grey and Dark Sea Grey over Sky (no unit given for this or any of the other planes). Two of the other USN planes are in the tricolor scheme of Sea Blue, Intermediate Blue and White (one with the red surround insignia and the other the blue surround version). The third USN plane is in overall Gloss Sea Blue. Only the serial numbers are different. As with all the new full color Czech Model boxes, there are full color profiles and three-views on the back of the box. I'm sure that a dedicated modeler would be able to browse some references and come up with something a bit more interesting. These planes also flew in bare metal or painted aluminum with a black antiglare panel on the nose. Perhaps some one will do 'Cutter's Goose' from Tales of the Gold Monkey and provide the pointed spinners to go along with it. That would be great! Of course, there are also lots of civil markings that could be utilized as well. 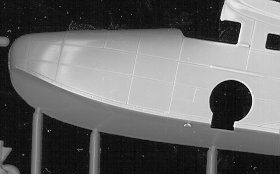 It seems from the additional teardrop side window bits added and the missing spots on the sprues that perhaps other variants are in the plans. One thing for sure is that this kit has been long awaited by some and it is sure to be a popular build. It is going to near the top of my build pile so stay tuned!